This entry was posted in Nerd, Personal, Religion, Uncategorized, University of Michigan by Jasmine. Bookmark the permalink. Awesome post and completely truth! The Israelites were not following the ORDINANCES for tithes and offerings as commanded by God. What are those ORDINANCES? They are found in Numbers 18 where God commanded the tithe be taken TO THE LEVITES. Do YOU follow those ORDINANCES? Those ORDINANCES were nailed to the cross. According to Leviticus 27:30-33 the tithe came from GOD’S INCREASE of crops and animals, NOT from the income the Israelites got from selling their crops and animals. They got MONEY for selling their crops and animals as proved in Deut. 14:22-27. Abraham was rich in money (gold and silver). The tithe could NOT be paid with money while the Temple Tax (tribute in KJV) HAD to be paid with money, so they obviously had money. 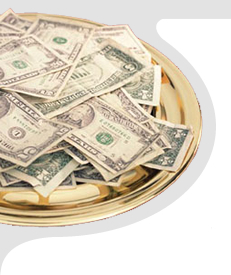 Every tithe shown in the Bible was paid on the NET and never on the GROSS. Abram’s tithe to Melchizedek was paid on the NET, after taking out the food his men had eaten. The Israelite farmers tithed on the NET crops after taking out the crops they were not allowed to harvest (around the edges and corners) and the gleanings, and after subtracting out the firstfruits which were commanded to be taken to the priests, not the Levites. The Israelite herdsmen tithed on the NET increase in animals. They had to remove the firstlings before taking the tenth as the firstlings were required to be taken to the festivals. You aren’t following even ONE tithing scripture. If you think you are, quote the scripture you follow. I believe the concept of God and his greatness surpasses all human understanding. God was around a long time before he allowed man to invent the system. In addition, it seems that you have to use math to relate to God and faith. Have you thought about accepting what is not seen and God’s word by faith? Have you replied to Gary Arnold? I would love to read your response. Thanks Gary I really appreciate your response. It’s quite unexpected in the manner which you debunk my debunkings, lol. I believe that could go back and forth and be quite exhausting. I’ve gone on your site and there is some very interesting commentary. Even if it’s not what you have described as the “Biblical Tithe”, it is not out of scope with making a difference with the upkeep of a place that is following God. It shows that a great deal has been put into refuting tithing. Continue to not tithe if you wish, and I will continue receiving my blessings. I’m excited and happy about my decision and will continue celebrating it! This post was initiated by belief/acceptance and included insight from what I have learned in school. God was indeed around a long time before man, and he was also around when he allowed man to “invent the system”; it was God that created the system. I appreciate you being such an avid fan of my blog! Thanks for responding to my comments, Jasmine. Fact is, you haven’t obeyed even ONE of God’s many tithing commands. Not even one. If you think you have, please quote the scripture you have obeyed. If you really study Malachi 3 in depth you will find that the blessing referred to is RAIN. Yes, rain. Nothing else. The curse was locust – the insects would destroy (devour) the crops. Being Spirit led, I find myself giving far more than a mere tenth of my income. I give because I want to give. I have already been blessed. I don’t give to get blessed. You can’t buy blessings from God. You are a victim of the false tithing doctrine that church leaders in the US invented in 1870. Giving is good, and I would never ask or recommend anyone to stop giving if they can afford it. But to think that God blesses because of tithes is to totally misunderstand the scriptures. Unfortunately, too many pastors lack faith that God will provide the funding for His Church and therefore resort to taking scripture out of context to convince their members that God requires or expects them to tithe. Such pastors will be judged accordingly. I, myself, stay as far away from such false teachers as I can, except when I am in a discussion with them on this topic. It breaks my heart and upsets me bigtime when a pastor I had respected admits to me that he knows his teaching is false, but that if he doesn’t teach it the way he does, people just won’t give. VERY SAD INDEED. The pastor thinks he must lie in order to get enough funding for the church and justifies it by saying he is bringing people to the Lord. The problem with debating this topic is that the victim seldom figures out that he is, in fact, a victim. The victim, instead, thinks he is a beneficiary of blessings. God can and will bless whoever he wants and for what ever reason he wants. God does know your heart, so he knows you are trying to do the right thing. May God Bless you, and may He open your eyes to His truth. Thanks again Gary for your input. I am happy with my decision and will continue to tithe.